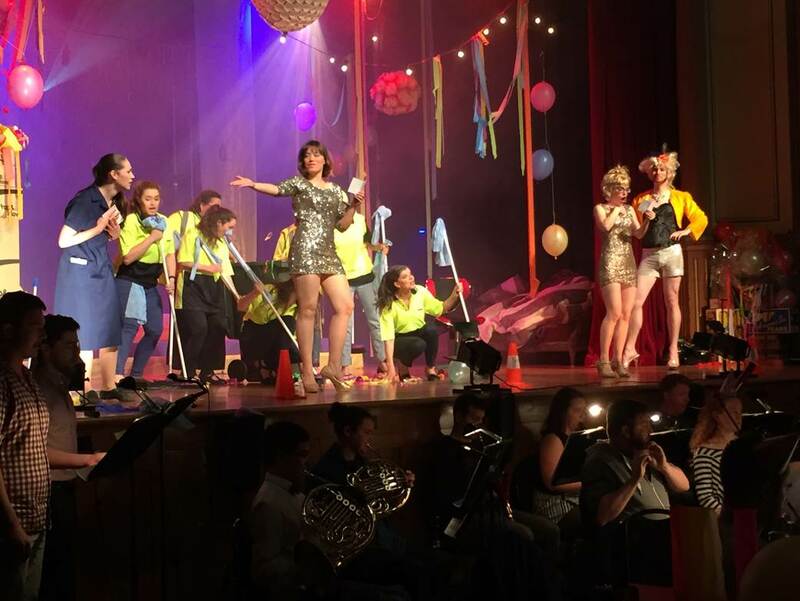 Glorious music is a clear highlight of CitiOpera’s new production of La Cenerentola, with a large orchestra and excellent singers bringing Rossini’s sparkling score to life. There is a revolution of sorts at play on the opera stages of Melbourne. Rather than making do with diminished showings from Opera Australia, smaller companies have more than ably taken up the slack in presenting lovingly staged, generously financed productions. The mark of quality of such productions is that experienced, talented singers are willing to be involved, to practise their art and maintain their exposure. The winners in this arrangement are audiences, who can enjoy affordable, accessible opera productions with first rate singing. CitiOpera’s fully stage production of La Cenerentola is certainly a fine example of this boutique opera movement. The company has assembled splendid singers, accompanied by a confidently polished orchestra of more than 20 players. All this, with a top ticket price of only $65. The season is held at the gloriously restored Hawthorn Arts Centre, which features easy parking and plenty of public transport options along with local places to eat and drink before and after the performance. The capacious foyer and ornately detailed auditorium add to the air of quality, making the venue ideal for opera. An orchestra pit is lacking, yet acoustics are fine with the orchestra positioned at the front of the stage. The standard of quality for the evening’s music is immediately evident with a nimble playing of Rossini’s delectable overture. Exacting conductor Trevor Jones clearly demands the best of his players, whilst also creating an air of enjoyment for all involved. To prepare an almost three hour opera to such an impressive standard without the luxury of professional (read: fully paid) rehearsal times is an extraordinary achievement, and speaks strongly to the nature of the project as a labour of love. The styling of the production is somewhat at odds with the timeless elegance of the music and the austere splendor of the venue. Director Theresa Borg’s program notes explain the concept as recycled objects being used to tell a recycled story. Beginning with the gaudy minidress-clad stepsisters blearily waking on the morning after the night before, Cinderella’s traditional role as a cleaner is expanded to a chorus of cleaners charged with mopping up after extravagant festivities. Set in present day, the selfish, self-centred, selfie-taking nature of the stepsisters makes perfect sense, with their boorish father Don Magnifico also a very recognisable character type. Disguised beggar Alidoro is a scruffily bearded drag queen in sparkling silver short shorts, and the Prince and his servant indicate their royalty with Games of Thrones t-shirts. Costume designer Marc McIntyre makes particularly good use of the recycling theme when Alidoro puts together Cinderella’s gown from discarded plastic with a packing tape belt and mop head wig. The magic happens offstage as she transforms the same look into a more refined costume and wig. 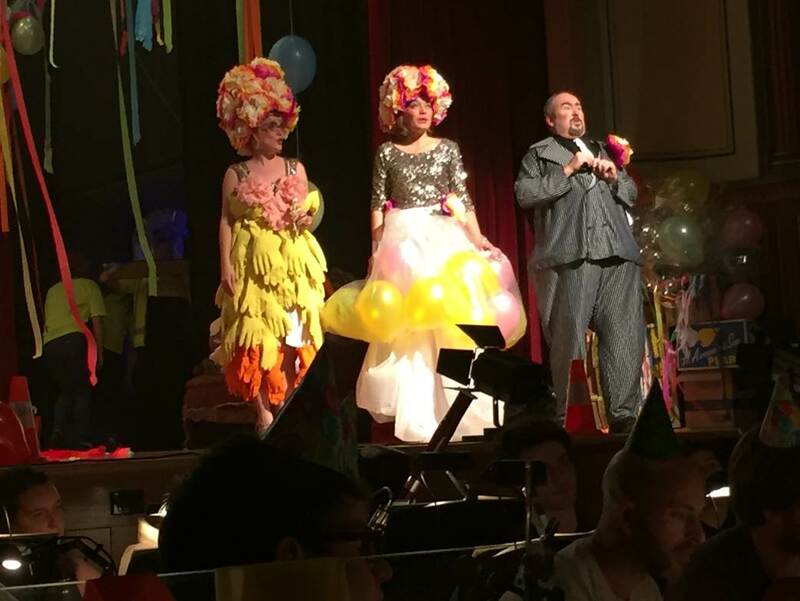 Topped with crepe paper floral headwear, the stepsisters’ ball gowns are a hoot, with one sporting a skirt of balloons while the other wears a skirt of rubber gloves. 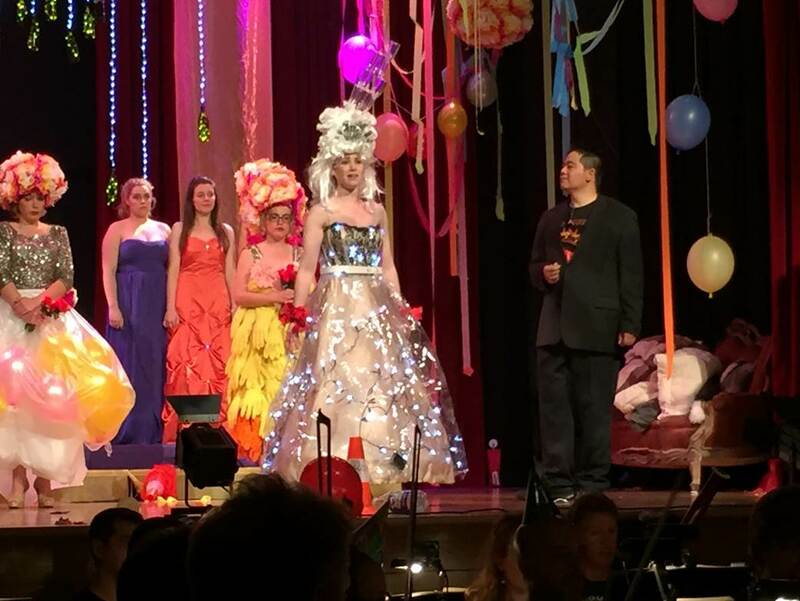 Daniel Jow’s lighting brings out the festive orange, pink and yellow the balloons and streamers of McIntyre’s scenic design. The overall aesthetic may not necessarily appeal to purists, but the concept pays ongoing dividends in continually providing amusing moments. Borg makes great use of the space, utilising a perfectly positioned balcony and having the characters come and go from all available doors and aisles. Presenting the recitative in English is a masterstroke, particularly given the historical precedence for this. Clear surtitles complete the accessibility of the performance. Kristen Leich delivers lovely singing as the virtuous La Cenerentola, with particularly strong high notes. While her volume is diminished by the position of the orchestra when she is singing on the floor upstage, the majority of her singing is heard clearly and easily. Henry Choo’s luxurious tenor is a pleasure to hear as Prince Ramiro. His rendition of act two aria “Si, ritrovarla io giuro” is rapturously received. Baritone Michael Lampard is in particularly fine voice as licentious manservant Dandini. As the blustering Don Magnifico, Adrian McEniery gives a masterfully balanced performance, in that he maintains precise vocal control while playing a staggering slob. In a similar vein, Genevieve Dickson as Tisbe and Carolina Biasoli as Clorinda deftly project the nastiness of theirs vain characters while singing with sweetness and purity. Matthew Thomas successfully sells the character of Alidoro as good-hearted party boy, landing several laughs with his delivery of updated recitative. Fortunately, the chorus of seven women has a chance to break out of their fluorescent yellow safety vests to play glamorous ball guests. These women provide a lively presence and sing beautifully. Male chorus vocals are provided by two gentlemen situated with the orchestra. 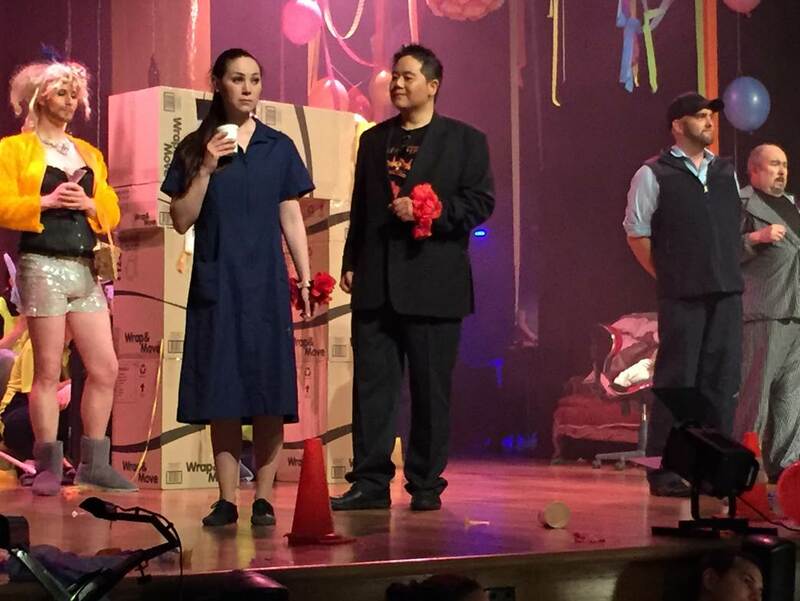 La Cenerentola by CitiOpera plays selected dates at Hawthorn Arts Centre until 6 November 2015.